A touch of smoky flavor lends depth to the familiar combination of romaine, Parmigiano, anchovies, and lemon. Like a traditional Caesar, it’s a great light meal with grilled chicken. This recipe contains raw egg; if that’s a concern, use pasteurized. Prepare a charcoal or gas grill fire for direct grilling over medium heat (350°F). With a mortar and pestle (or using the side of a chef’s knife), pound or mash the garlic to a smooth paste with a pinch of salt. Add the anchovies and pound or mash again until smooth. Transfer the mixture to a small bowl. (Or, if the mortar is large enough, leave it in the mortar.) Add the egg yolk. Whisk in the lemon juice, then whisk in 1/2 cup of the olive oil in a slow stream until emulsified. Add the Parmigiano, and several grinds of black pepper and whisk to combine. Season to taste with more salt or lemon juice. Brush the bread slices on both sides with olive oil. Grill until toasted, about 1 minute per side, then cut or tear into bite-size pieces. Put the romaine on a baking sheet and drizzle with the remaining 3 Tbs. olive oil. Toss gently to coat evenly and season with salt. Place the romaine on the grill cut side down and grill until nicely marked, 1 to 2 minutes. Turn and mark on the other cut sides, 1 to 2 minutes more. 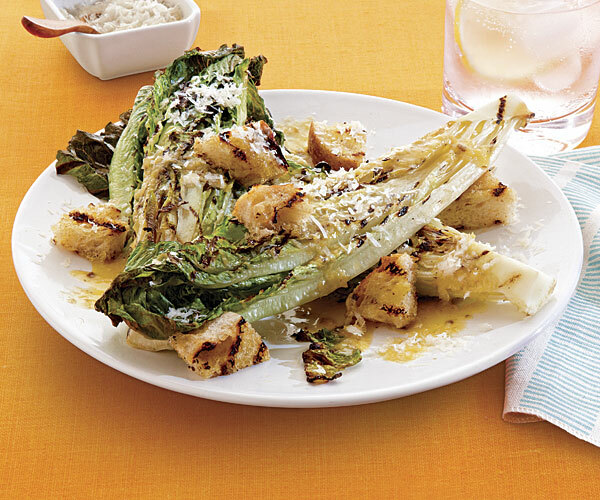 Transfer the grilled romaine to a platter or individual plates, and sprinkle the croutons on and around the romaine. Drizzle a generous amount of the dressing on top and sprinkle with additional Parmigiano. Serve immediately, passing any remaining dressing at the table. 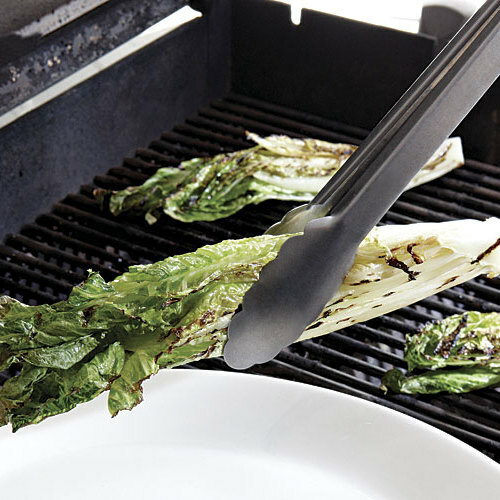 We've grilled romaine a number of times recently, but this recipe tops all of our previous efforts. Only two of us, so enough dressing to have again day after tomorrow. Hurrah! Simply fantastic. Even my husband, who is an unwavering fan of classic caesar (i.e. ungrilled), loved this and had a second helping. Easy enough to pull together at the last minute, while the grilled entree/meat is resting. Impressive presentation for a summer dinner party. Will be making this again. This recipe was so good! Made this on the Big Green Egg last night. It was great.